As far as giving treats constantly well I don’t do that. I’ve seen people who click and treat for everything and guess what their horses are spoiled, pushy and some become dangerous. When I work with a horse I do click and treat a lot in the beginning but once the horse shows me they know the behavior on a consistent basis I phase out the click and treat. Horses are very smart and have great memories so after performing the behavior on a consistent basis I then add in a cue. The only time I go back to clicking and treating is to either enforce a behavior or teach a new behavior. Some people feel like clicker training (positive reinforcement) causes the horse to always be searching for treats and in the beginning with an inexperienced handler they might. When I teach this method of training I don’t allow a horse to do this, but there are those that will allow the horse to extinguish this behavior. Now if you reward them every time they look for a treat then it is your fault as you are teaching them that. In my programs I don’t teach tricks. I teach horses good foundational skills that people can build on and take the training to a more advanced level. Tricks may be fun, but I believe a solid foundation should be put in place first. I always tell people to keep in mind that the horse might not be with them forever and if all they know is tricks they may be hard to place unless they are going into the movies. If you put a solid foundation on a horse those skills can be used in any home and in my opinion it makes them more valuable. Now with that being said I do have a 29″ miniature horse that I may teach tricks to later on cause he is too small to ride, but one thing about it he has good foundation skills. I want people to know that clicker training (positive reinforcement) is a very powerful communication tool that when used properly will get you amazing results with your horse. This training method is like any other training if it is not done properly you will create problems. It’s not clicker training that causes problems with the horse it’s the person using the clicker that causes the problems. 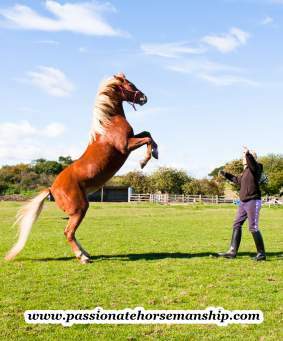 With Natural Horsemanship I’ve seen people cause problems with the horse because they were not doing things properly so take the time to learn how to use clicker training properly. Want to learn how to use clicker training with your horse? Contact me today to set up your lesson (325) 261-3360. Thanks for sharing this valuable information. I know some people ‘overtreat’ and end up with horses that nip and do not realize that they (the horse) has to do something to get the treat. I think it is about being consistent with the horse. If they perform correctly – they get a reward. It may be a treat, pat, or ‘click’. The key is, however, to train the PEOPLE when to give the reward. Right? The horse can only guess what we want, and if we say “YES, By jove you’ve got it!” then they will be more likely to do it again. Contrast this with a rider, trainer that says, No, wrong, uhun, nope, wrong again. After awhile the horse will not even try to do anything. thanks for sharing your valuable information! Nancy Degan, a seasoned hunter- jumper and trick horse trainer of over 30 years, is always finding new and fun ways to teach her horses. She don’t use clicker training but instead uses praise and positive reinforcement.. Nancy trained her Thoroughbred Knightline and Arabian Quarter trick horse Sterling Silver to lip synch to over 25 songs, load a video tape into the VCR, push drink selection buttons on the soda vending machine, answer and hang up the phone, rear and buck on command, play soccer, sit, sit and wave or roll the ball under his hoof, play dead, spanish walk, hug and so much more. I also show jumped him, winning over 80 championship show jumping as high as 6 ft. against top pro riders and former olympic riders. Nancy has also trained hundreds of students and their horses where they also won many championships at a rated horse shoes, both in the Mid South (Germantown, Tn.) and on the West Coast. Cherry and Nancy Degan were on America’s Got Talent on the L A Orpheum stage when Cherry was only 2-1/2 years old, her first tv show ever, performing a 22 step hind leg walk with a TRIPLE ballerina pirouette, finishing into a perfect bow in front of a live audience of thousands, and the audience went wild! They beat out over 50,000 acts. Cherry performs over 15 tricks , jumps as high as 3 ft, and also drives her miniature horse cart. She regularly performs and wins publicly in parades, fairs, festivals and at private celebrity events, including soecial red carpet invitations. She works regularly on set of tv shows , feature films, and commercials. We are doing new things all the time. You can see more at http://www.youtube.com/fillyndiamonds, and please visit our facebook page, “Nancy Degan and Cherries Jubilee”. They are also on http://www.Gigmasters.com/animalsforparties/Cherrypartypony. Nancy I loved the video of your miniature horse jumping through the hula hoops, awesome!